Designing a new product such as the Boeing 787 is a huge undertaking. The thin plastic skin on the 787 Dreamliner, writes The New York Times (July 30, 2013), ”is an engineering marvel, a mix of carbon fibers and epoxy molded into large barrel-shaped sections that are then baked at up to 350 degrees in giant ovens.” But while airlines love how this lightweight concoction saves fuel, the recent fire on a Ethiopian Air 787 in London provides the first test of how much more difficult and costly it will be to repair serious damage than on older aluminum planes. Each day a jet remains grounded costs an airline tens of thousands of dollars. The cause of the fire, a pinched wire on an emergency transmitter, was fairly mundane. 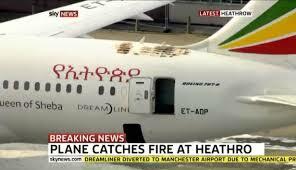 But the high temperatures weakened the supports in a 10-foot stretch at the top of the rear fuselage and seared the paint on the top of the skin, causing the most extensive damage yet to one of the new 787s. Boeing will have to cut out the damaged areas and bolt a large patch, made of overlapping panels of composite materials, onto the plane. It will also need to install new composite supports and shore up the structural integrity of the plane. If the damage were more extreme, Boeing could remove the entire 23-foot-long barrel containing most of the jet’s rear fuselage and snap in another one. The use of composite materials on planes has grown steadily over the last 4 decades. Only 1% of the weight of Boeing’s 747 jumbo jet came from composite parts when it was introduced in 1969. That increased to 11% by 1995 on the 777, which has an all-composite tail section. Composites now account for half of the 787’s weight, which, together with more efficient engines, cut fuel consumption by 20%.